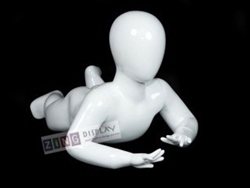 Headless Child Mannequin in White. 41" Tall headless child mannequin with basic strait on pose. Great for your4-5year toddler clothing display. Made of fiberglass and ships with base. Size: 42" x 13" x 10"